In the booze collared, working man’s neighborhood of God’s Pocket, the mechanics wear grease like warpaint and barflies speak in a Morse code of glass clacking. Everyone is a regular Joe with a hot temper or a finger-wagging opinion, but they have all grown up together and treat each other with respect. John Slattery, known for his electric charisma in AMC’s Mad Men, dusts off the director’s chair for his feature length debut. Based on Pete Dexter’s novel of the same name, God’s Pocket was a project that Slattery labored over for some three years before mapping it out on film. If seen through a supercilious lens, the result of the film’s sometimes atonal direction can seem disappointing or inexcusable. Still, Slattery’s morose exercise in gallows humor is rewarding enough, partially due to its cast buying into the monochrome world the film is set in. Nobody can say that God’s Pocket doesn’t look the part: lowly as a snuffed out cigarette and having the ever present brine of ancestral misery coursing through every resident’s bloodline. Cinematographer Lance Acord builds a eerie, inescapable atmosphere that is reminiscent of Clint Eastwood’s Mystic River or Ben Affleck’s Gone Baby Gone. And while the picture can feel a little flat or claustrophobic at times, the constrained mood is matted with purpose. 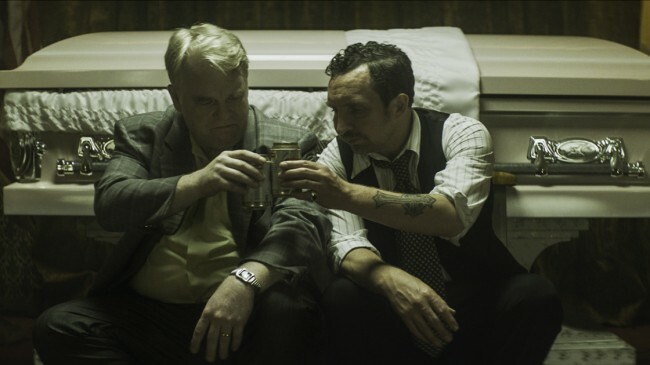 An outsider to the town, our protagonist is a misunderstood and somewhat portly man named Mickey (Philip Seymour Hoffman), whose dubious decisions lead him to inevitable – and incurable – disparagement. By his side is Jeanie (Christina Hendricks), his somewhat aloof and sullen wife; her son Leon (Caleb Landry Jones), a miscreant who could double as one of the kids from William Golding’s Lord of the Flies; and Bird (John Turturro), a no nonsense kind of guy from the neighborhood. When Leon is killed during his work shift, Mickey finds himself galloping to an uncertain end. God’s Pocket benefits from the incredible supporting cast, which includes a great, serpentine Eddie Marsan performance. But Hoffman’s nuanced man-under-siege is something to behold, as any other actor playing Mickey would turn the character into an unaffected dolt, free of complexity and chalked full of derision. Hoffman was a guileless actor whose entire being would be transplanted unto the film he was participating in, and throughout every scene in Slattery’s opus that very feeling is omnipotent. While the whole of the Pete Dexter adapted novel seems deplorably uneven at times, there are fragments – sometimes entire scenes – that pulse with energy (a particular sequence with an unsuspecting man and two heavies may take you by surprise). As a Hoffman completest or a Slattery fan, there is no reason not to find yourself wading through the dust, dirt and debris of God’s Pocket. The program director of the Olympia Film Society, Rob is also a former San Diego Film Critics Society member. He has written for The East County Californian, The Alpine Sun, The East County Herald, The San Diego Entertainer, and the San Diego Reader. When he isn't curating a film festival, he is drinking rosé out of a plastic cup in Seattle or getting tattoos from Jenn Champion. Founded in 2008 by Rob Patrick, Cinema Spartan's primary function was to initiate conversation within the San Diego community about film. Since then, it has branched out into a myriad of topics, including music, art, and popular media. Cinema Spartan is a major motion picture credentialed outlet with membership in the San Diego Film Critics Society. All articles and content are copyright © 2017 Cinema Spartan and its respective writers. Like Cinema Spartan? Help spread the word by sharing with your friends!